I sat in a pew this morning, the first time in more than a month. I’m not sure why it’s been this long without attending the church which I love, but it has. But it doesn’t mean I haven’t been to worship since then. I like to think that I worship the Divine (or God, or Universe, or Spirit, or whatever name you feel most comfortable with) on a daily basis. I worship this Presence when I ride my bike, for example, and when I take photos, and when I have a meaningful interaction with someone, be it a friend, family, co-worker, or complete stranger. I also worship this Presence when I lay in bed in the morning just after the alarm goes off and it’s the beginning of a new day. Because, to me, God is in all things (including you and I) and is, in fact, what makes each one of us connected to and inseparable from not only each other in some indescribable way, but also the very source (or consciousness) from which we came and will return. So today I worshiped the Divine more formally, in church. And it felt good. The guest preacher spoke on the Epistle of James, which is one of the oldest books in the New Testament and is attributed to James the brother of Jesus. It’s a somewhat small book but has a powerful and straightforward message. Some say it is a blueprint for daily living. Personally, it has had a profound effect on me and I return to it often. To me, the book is a synopsis of what Christianity at it’s core is about…not just having faith in a Higher Power, but having action as well. Then, during worship this morning, as the congregation stood and recited the Lord’s Prayer in unison, it moved me as it often does. The words themselves move me, but so does the thought of so many others around the globe saying this prayer (possibly at that same moment). I hope that some of us—myself included—listened to what we were saying, letting the words sink in and take root. Last year when I was in NYC I witnessed something I will never forget. A homeless man asked a person to buy him a hotdog from a street vender because he was hungry. The person he asked (wearing a suit) not only bought him food, but he bought himself some as well and then sat on the sidewalk and ate with the man. To me that was not only worship, it was holy communion (Namaste…the soul within me acknowledges the soul within you). Just being nice to one another—and seeing each person as an equal—can make such a difference in someone’s day (including your own). It’s not always easy but it is possible. When I write these things I am doing so because sometimes they just need to come out, but mostly because I need reminders for myself. And in a way, this in itself, I suppose, is a form of worship, and when you read this we are in sanctuary together. Priest, mystic, monk, activist, writer, poet, and artist, Fr. Merton was a true renaissance man. He was friends with Thich Nhat Hanh, and the Dalai Lama, and a contemporary of Martin Luther King, Jr. Before his untimely death he penned a huge number of books pertaining to spirituality, poems, artwork, and an incredible and moving autobiography. His work continues to touch countless souls…including the one typing these words. I love the opening line to his autobiography, the Seven Story Mountain…“On the last day of January 1915, under the sign of the Water Bearer, in a year of a great war, and down in the shadows of some French mountains on the borders of Spain, I came into the world.” Thomas Merton was born 100 years ago this month; to read more about him click here or here. 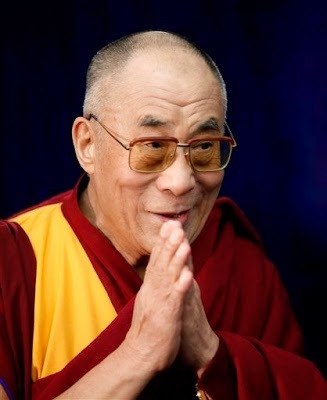 Click here to go to the Dalai Lama’s website.